I have never made hot cross buns, but always wanted to. A few weeks ago, I spied a recipe in Waitrose magazine for Brandy-spiced hot cross buns (on the cover of the March issue if you fancy picking up a copy). The recipe is by someone called Lily Vanilli, I must confess I’ve never heard of her but will certainly look out for her things from now on as these turned out amazingly well. My partner gave a little whimper as he ate one, warm from the oven, split and buttered. Lily Vanilli says to soak the sultanas overnight. I did, but if you don’t have time, leaving them for a few hours will I’m sure be fine. No recipe on the Waitrose site so I can’t link to it. I found it made 12 buns. a piping bag and a very fine, writing nozzle. 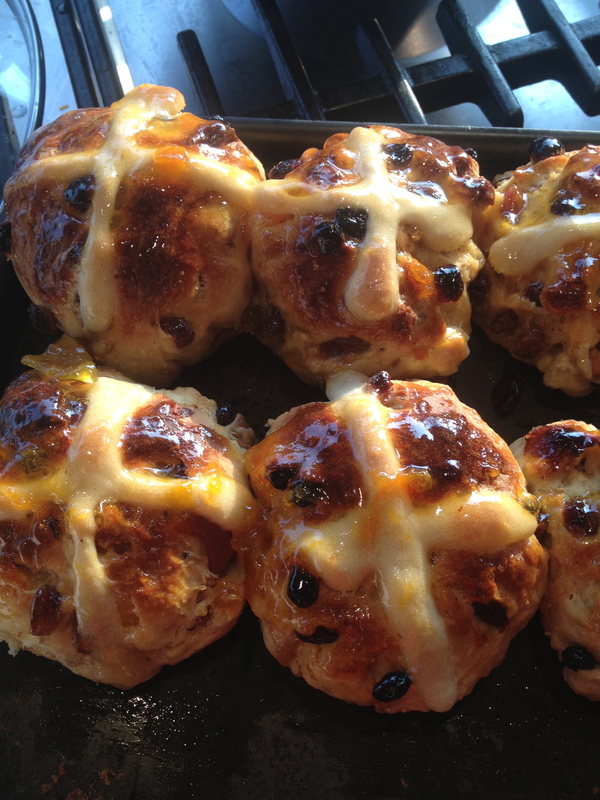 I used one that was a bit too thick and ran out so some of my buns – shock horror – were uncrossed. Vanilli puts hearts on them but I’m Catholic and you know.. The very first thing to do is put the sultanas to soak. So put those ingredients: ie the sultanas, spices, zest etc, except the 2 tablespoons of flour, all together in a bowl and leave overnight or for a good few hours. Then, when ready to start baking, strain the sultanas. Discard the liquid and the star anise; although personally I don’t see why you can’t DRINK IT the liquid. It’ll be very alcoholic though so you know, not before the school run or before the social worker calls. Now scatter on the two tablespoons of flour and mix around. This soaks up any excess juice. Put the milk and butter on and heat gently until the butter has melted, stir around. You need to get this to lukewarm, not hot so you may need to set it aside to cool a bit. Don’t let it get cold either. Ooh the pressure (it’s fine don’t worry). Get a large bowl, put the strained sultanas in it and now add the flour, sugar, yeast, nutmeg, salt, figs and apricots. Mix it around, thinking of Easter eggs and having a lovely weekend. When the milk is lukewarm, whisk in the egg and then add this milk, butter, egg mixture to your sultana, flour etc mixture. Mix it around until you get a dough. Give it a little knead on an oiled board. Leave it for ten minutes. Give it a little knead, leave it for ten minutes, give it a little knead, leave it for ten minutes. The timings are important (Vanilli just kneads for ten minutes flat out, I don’t do this) as you’re dealing with commercial yeast. Now knead for one last time and leave it for about an hour. Here’s a pic of the dough just before I shaped it. Now, either gently knead it again and shape it into buns and cook it (more on this in a mo) or shape it into buns and do as I do, put it in the fridge to prove overnight. I took it out for a few hours before hand to bring to room temperature, but only because the youngest woke me up at 4am. Otherwise I had every intention of just putting them straight in the oven. If you don’t prove overnight in the fridge, shape them into buns and place onto a greased baking tray. I got 12 out of them, it figures that you can make these fuckers as big or as small as you like. And then leave until doubled in size. God they always say this don’t they, but who remembers what size they were in the first place? I always leave for longer than 45 mins as I live in the country and it’s cold here. So use your common sense. 45 mins, an hour, maybe longer. As I said, academic as I did them in the fridge overnight with two hours to get to room temperature. When ready to cook, preheat oven to 220C, mix together the 50g of flour and the 60ml of water and pipe a cross onto the buns. Cook for ten mins at 220 then lower to 200 for another 10 mins. Whilst they’re cooking, mix together the jam and water and brandy. When out of oven, immediately brush the tops with the jam mixture to make a lovely glossy top. Here they are glistening in the morning sunshine. I really had no idea they would be so good. These are the best hot cross buns I’ve ever eaten. I hope you enjoy them! Happy Easter. If you fancy something a bit more continental this Easter, try panettone tea cakes or colomba. Or even torrone! Freezing note: These freeze really well. The only note I’d add is that the ‘cross’ part doesn’t survive freezing too well, it goes hard. So if you do plan to freeze these, don’t decorate the ones you plan to freeze. If you freeze excess ones and they have decoration crosses on them, then be aware of this. We ended up picking our crosses off (sorry God). The rest of the bun was still delicious! 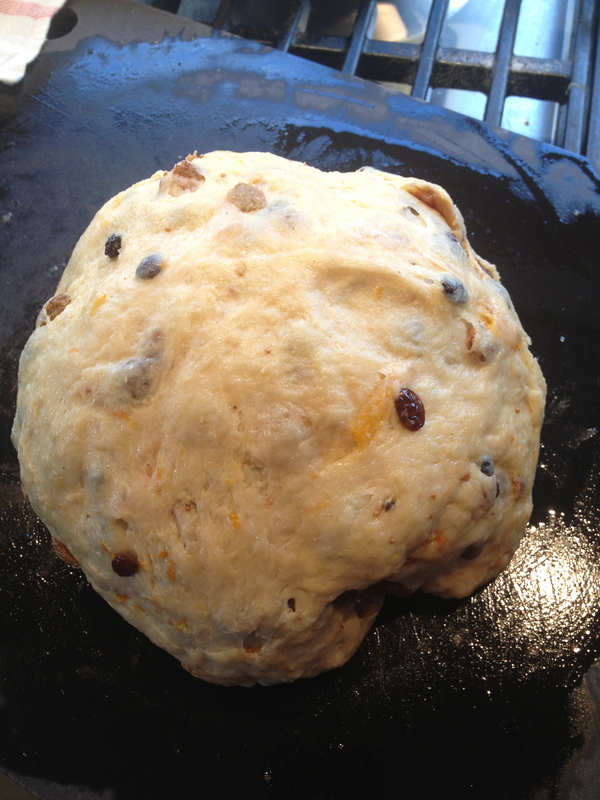 This entry was posted in Buns, Celebration, School fete, Teatime and tagged dried apricots, dried figs, easter, hot cross buns, spices on March 28, 2013 by Annalisa Barbieri.